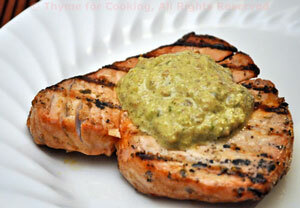 Grilled Tuna with Pesto Sauce, healthy gourmet from Thyme for Cooking. A simple dollop of pesto sauce is a great accompaniment to grilled fish. Mix oregano, oil, vinegar and ketchup. Brush onto tuna and let marinate for 10 - 25 minutes. When ready grill over direct heat using grill basket, mat or directly on the grill, brushing with oil first. Grill for 2 - 4 minutes per side for medium rare. If not sushi-grade, cook until medium - medium well, still pink in the middle, 6 - 7 minutes per side, all times depending on thickness of tuna and personal taste. Can also be cooked under broiler or sautéed in nonstick pan for roughly the same amount of time. Mix pesto, olive oil and vinegar. Serve with 1 1/2 tbs Pesto Sauce on top of each steak.